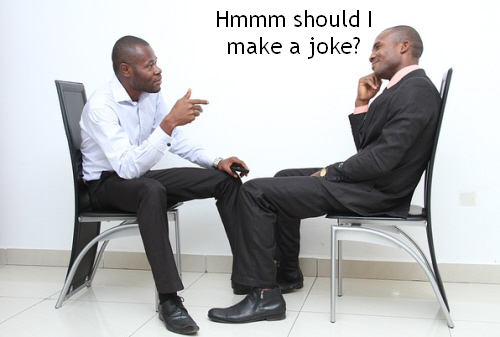 Should you be funny during an interview? What a great question. And no doubt in your interview you will get asked many more great questions. So it is important to be prepared. Doing your research and knowing rough answers you can give to expected question is reasonably straight forward, depending on the type of job of course. But is it good to be funny during an interview? And can you prepare for that? First off, interviews are about letting your personality come across and showing you are who you are. So if you love a good joke then you don’t want to suppress that. On the flip side if you are more shy and not a big joker there is no point trying to be the funny guy. That just isn’t you. Always keep this in sight, letting your personality come across is the vital thing. Unless your a bit of a sausage of course, then hide it as best you can. The type of job you are going for may also affect whether its good to make the interviewers chuckle. If you are trying to get a job with a small building firm where you can see a group of guys work who feel its important to joke around now and again, then making them laugh once or twice is a good thing. It will make them think “yes, this person would be decent to work with, I can see us getting on well”. But in other jobs, perhaps trying to make them laugh may hinder you. Consider the type of job you are going for, and that can impact your decision. Another vital thing to remember, is not to prepare to be funny. There is no point trying to remember something funny to say, or a joke to tell them. How are you going to fit it in, and you may be thinking about when the moment will come to say it. Should you make them laugh early, at the end, or what? If you start thinking about this it will hurt you more, and likely stop you from being natural. If your mind is clear, you are answering their questions fluently, and getting yourself across naturally, then that will be the best door for a bit of humor. That way if something funny is there to be said you will be in the moment and in the right flow that allows it to come splurting out of your mouth. Of course, don’t say anything stupid, perhaps leave the poop jokes behind for now. Good luck, and may the job be yours. Do Funny or Die pay users to upload?